Fear and disappointment or happiness and hope were among the choices for thousands across the continent. It comes as no surprise that Europeans are wary of Trump's presidency. 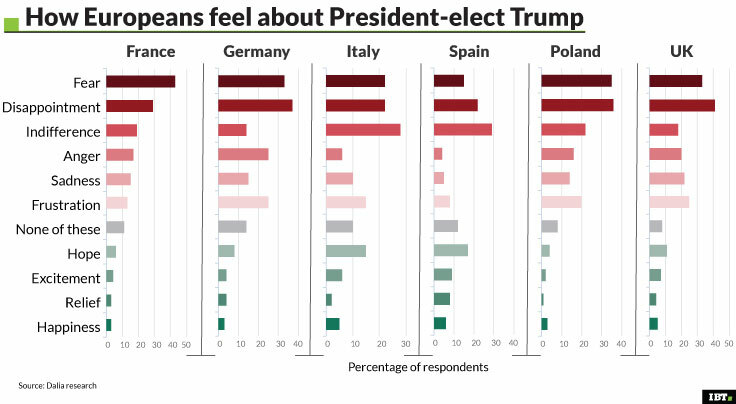 But on the eve of his inauguration new numbers show just how fearful, sad, and disappointed Europeans actually feel. A new poll of people in major European countries, including Germany, France, Britain, and Poland finds high levels of negative emotions when asked about their feelings on Donald Trump as he prepares to take the oath of office. Conducted by Berlin-based mobile researchers Dalia for IBTimes UK the poll is as part of a larger study of 10,000 people from across the EU's 28-nations gauging their political and moral attitudes. Fear about Trump's presidency was strongest in France where 43% of respondents said they were afraid about his presidency, followed by Poland (35%), and Germany and the UK tied at 33%. In the UK 41% of people said they felt "disappointment" with high numbers of others in Poland and Germany feeling the same. Positive emotions like happiness, excitement, and hope failed to describe their feelings. The highest amount of "hope" that respondents felt was in Spain at 17%, and the country also led in feelings of "happiness" at 6%. Feelings of "relief" and "excitement" failed to break out of the single digits across Europe. "The European centre of [political] gravity is, and always has been, some way to the left of that of the US," said British political scientist Robert Hazell at University College London. "We view Trump with dismay, bordering on horror, for all the reasons that you've read about." In an interview published on 15 January Trump called the Nato military alliance — originally forged to guard against the former Soviet Union — obsolete. Repeatedly throughout his election campaign Trump questioned whether the transatlantic alliance's members were paying their fair share, suggesting the US may not honour its treaty obligations to protect other members. "We view with real concern his wild statements about whether the US will continue to be a reliable partner," Hazell said. "There is a real fear that the United States may be about to enter a period of isolationism," he added. In the long run this would "be dangerous for the US and not just for Europe." Whether the US likes it or not, Hazell said, "it is one of the world's most important international policemen." Feelings about Trump in Europe haven't improved – and may be even worse – than last year. Before the 2016 election last June, a Pew poll showed that across European nations just 9% of people had confidence that Trump would "do the right thing" in world affairs. "I think Trump has his work cut out for him in Europe," said Dr Jacob Parakilas, deputy head of the US Programme at the international affairs think tank Chatham House. Last week Trump also said that he won't work to stop nations from leaving the European Union, drawing condemnation from German and French leaders Angela Merkel and Francois Hollande. Trump is "taking the side of the European far-right over its established governments and established political order," Parakilas added. "That makes him very popular in the part of Europe that actively supports the far-right, and very unpopular in the rest of it."